Firstly, you need to make sure that your nails are clean and dry before application. Then, you need to apply one coat directly onto your nails. Nail HQ say that this can be used underneath nail polish as a base coat, but don't apply it over the top of nail polish. 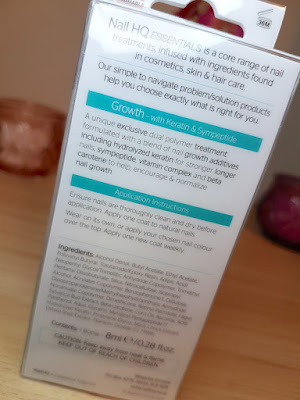 As it could be used either way, my mum decided to try it alone, and I decided to try it with nail polish over the top so that we could review both types of usage. The brush is thin, but it still fans out into a good shape to cover the nail sufficiently within a couple of strokes or so. The formula itself goes on like a glossy base coat at first, so you can see where you're applying it. It does dry pretty quickly and begins to turn more matte. It only leaves a slight heaviness, but nothing like the type of "heaviness" you can feel if your nails have a couple of coats of polish on them. Due to going with different testing methods, it was apparent fairly quickly that we were having differing experiences. After a day or so for me, my nails were fine. There were no apparent differences between this and base coats that I've tried. For my mum, however, she had noticed that the treatment had become a bit sticky. She has red and black sheets in her bedroom, and she noticed that the black from that had become stuck on the nails, leaving them looking dirty. Because of this, she decided to coat them up with clear nail polish to prevent more stuff sticking to them. As a base coat I find that nail polish adheres to it pretty well for a long lasting finish. I found that my nail polish was still unchipped a week later, but I did have another issue. It may have taken longer than the time it took for my mum to experience it, but after a couple of days my nails also had a kind of stickiness to them. It sort of made my nails feel tacky, as if they were still drying, but it was a couple of days after painting them. There were prints appearing on my nails, like if I had pressed it whilst still damp and my fingerprint had appeared on the wet nail. It's hard to report back on the long-term results as neither of us have used it for long enough, but putting the stickiness aside, the short term results are certainly promising. Both my mum and I have been noticing that our nails do feel a bit stronger and haven't broken as easily. My mum did still have a couple of breaks, but not as many as usual, so it was an improvement. She is also happy to let you all know that her nails on her little fingers are finally growing again thanks to this treatment, which are the two she has trouble with. As I said, it's hard to pass more of an opinion on results as it does need more time to test thoroughly. Both of us are in agreement though that we would continue to use this product, but with a couple of tweaks as to how we would use it. Nail HQ state to use this weekly, but we both feel that the stickiness after a couple of days would mean removal and reapplication. I guess this is more for trial and error. It is also an affordable product, so if you are having trouble with your nails, it wouldn't be costly to give this treatment a whirl. 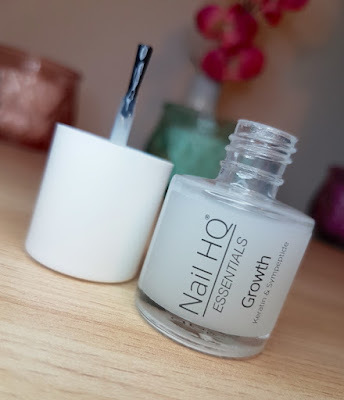 You can purchase the Nail HQ Essentials Growth treatment from Soinvogue. What are your thoughts on the Nail HQ Essentials Growth treatment? 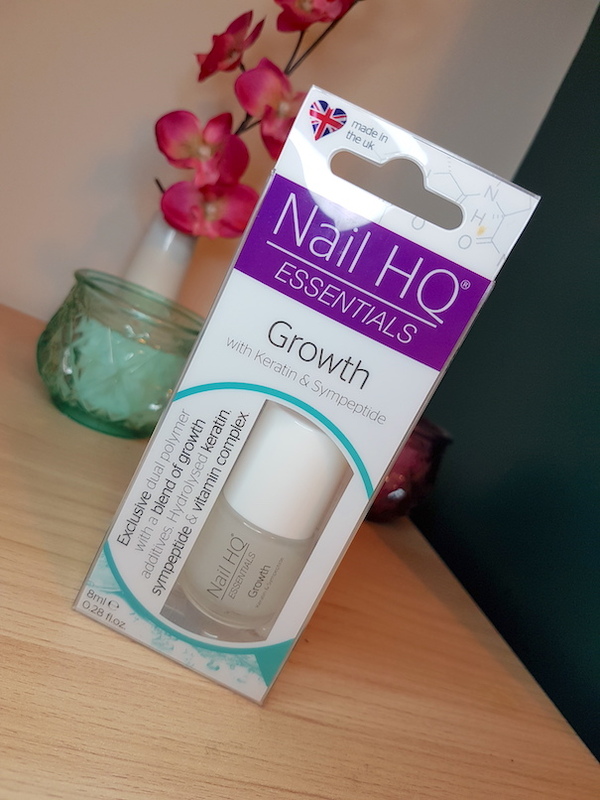 What's your favourite growth treatment for your nails?